Major networks have all been scrambling to find a paranormal team that can bring in viewers and tap into the widely popular ghost hunting and paranormal investigation programs on the air right now. Syfy Channel saw it fitting to back a paranormal team that is offering a unique perspective and investigative process. This team would be the heart of Fact or Faked: Paranormal Files. It would be their uncommon process of investigation, and rather eclectic team in general, that would make the show widely popular in a short time. The team is comprised primarily of six members, the leader of this group being one Ben Hansen. His background as a former investigator for the FBI, and before that being on an SVU task force in the state of Utah, has made his senses sharp and keen. Next on the list is Jael De Pardo, a skilled journalist. Her abilities throughout her career in determining the real story from a fake one has made her a valuable asset to the team. Next, is the scientist Bill Murphy. He is one of the leading experts in paranormal phenomena. He is the walking encyclopedia of the group, offering up information to help through almost every investigation. The final three members of the team are Austin Porter, Lanisha Cole and Devin Marble. They are the expert, the photographer, and the tech expert respectively. The premise for the show is that this expert team of investigators takes footage, photographs or other means of relaying a haunting or spirit and attempts to verify the information. Essentially, they are attempting to find any truth in the picture, the video or the story. 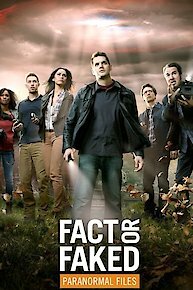 The show's title, Fact or Faked, is the objective question of each episode and every particular investigation they do. In the second season finale, Destination Truth's Josh Gates teams up with the group as they head to Iceland to check out footage of an aquatic creature. Later, Pro wrestler Kofi Kingston assists in a Stonehenge investigation. Paranormal files from England and Kentucky are investigated. The Oregon Vortex is probed. Also: An English pub is visited after a security camera captures the image of what may be a ghost. The team investigates "evidence" of paranormal activity documented at a Mississippi graveyard and an abandoned Missouri truck stop. The team investigates claims of a UFO sighting in Florida and a haunting in Colorado. Josh Gates assists the team in examining evidence of a gargoyle sighting in the U.K. Claims concerning a spectral cat are investigated in Kentucky. The team check out evidence that backs up a claim of a reptillian creature sighting in South Carolina. Footage of paranormal activity at an Ohio gas station is examined. The team investigates claims of a ghost lurking on the USS North Carolina. Also: A purported UFO sighting in Michigan is investigated. The team heads to Jefferson, Texas to investigate photographs of paranormal activity at the Pride House. Later, they investigate claims of Bigfoot sightings in Kentucky. The team heads to England to investigate footage of an alien abduction. The team tracks a hovering light over Bodega Bay and a New Jersey ghost. Footage of an allegedly levitating Atlanta woman is put under the scope. Also, an ice bath becomes a test of endurance for a proclaimed "Ice Man" from Los Angeles. Purported poltergeist activity in a Texas bar is probed; footage of a flying witch is scrutinized in Mexico. Footage from the Bird Cage Theater in Tombstone, Ariz., is scrutinized; a UFO sighting over a Los Angeles freeway is probed. The Waverly Hills Sanatorium in Louisville is investigated following a video of a purported ghost sighting; UFO sightings over Mexico are probed. One team hunts for ghosts at the legendary Myrtles Plantation in Louisiana, while the other attempts to authenticate UFO footage linked to Area 51. An alleged UFO accident is investigated in New Mexico while in Nevada a graveyard ghost sighting is probed. One team investigates the Whaley House in San Diego, which some say is the most haunted home in the US. Meanwhile, the other team looks into footage of an unknown creature which is said to inhabit Florida's Loxahatchee River. One team investigates footage of a chupacabra which was recorded by a Texas sheriff's dashcam camera, as well as DNA samples of an unknown creature found by a local rancher. The other team explores a newsreel of an alien walking behind a reporter in Argentina. One team investigates a haunted playground set in Argentina, while the other team looks into the story of a Florida family who claims to have been visited by aliens many times over ten years time. One team investigates footage of a UFO taken by a police helicopter's night-vision camera, while the other examines supposed photographic evidence of ghostly ectoplasm which was taken by a surgeon in the 1920s. Bill, Chi-Lan and Austin head to Jacksonville to check out a video of a ghost sitting in the balcony of the haunted Florida Theater. Meanwhile, when sightings of a mysterious triangular formation of lights appears in the skies over both New York and Texas within a few days of each other, Ben, Jael, and Devin head to El Paso to see what they can uncover. In the second season premier, Ben, Jael and new member Devin head to Los Angeles, to investigate claims of the first UFO government cover up following the bombing of Pearl Harbor. Meanwhile, Bill, Chi-Lan and Austin head to the RMS Queen Mary, to investigate paranormal activity. In the season finale, one team heads to a Louisiana Bayou to check out a swamp monster. Meanwhile, the other team heads to Oregon's Willamette River to look into a strange light that has been witnessed by many. The team's latest investigation is out of this world. Part of the crew heads to Australia to investigate claims of a mermaid. Then the rest of the group goes to Hawaii to see a family who has photos of a guardian angel. Half of the team travels to Washington to track down Bigfoot while the other half dissects what appears to be a classic alien encounter. The team continues to explain the unexplainable. After choosing two compelling cases to investigate, Ben, Austin and Chi-Lan travel to Alton, Illinois to test a mysterious cloud of mist that appears in a video taken inside the historic - and reportedly haunted - McPike Mansion. They test several different theories to see if the original video could have a natural explanation or if the mist is actually some kind of ghostly entity. Bill, Jael and Larry take off to Northern California to investigate a strange UFO case in Fremont. They attempt to replicate the delta shaped light formation seen in the footage by launching a variety of illuminated objects into the sky and obtain surprising results. While in an abandoned cemetery, a ghost hunter inadvertently catches a ghost she believes is from the Civil War. Is it fact or faked? In Colorado livestock are being mutilated and the answer seems to be from above. The team investigates the mysterious lights on the horizon in Michigan. In San Antonio, TX, the team looks at the railroad tracks that defy gravity. Ben and the team investigate the footage of a predatory beast in the United Kingdom. Then their are claims of a triangular craft in California. The team takes on a claim in a Pennsylvania town that a lake has it's own Loch Ness Monster. Then in L.A. a couple believes they have been communicating with the spirit world for over a decade through the medium of photographs. Is it fact or faked? In Fresno a man is shaken up by an image appearing on his television screen. In Lake Havasu, a flying saucer is videotaped flying over the lake. Former Agent leads his team to investigate the mysterious case of the Georgia ghost Car. Fact or Faked: Paranormal Files is currently available to watch and stream on Syfy. You can also buy, rent Fact or Faked: Paranormal Files on demand at Amazon, Vudu, Destination America, FandangoNow, Google Play, DIRECTV NOW, iTunes online.